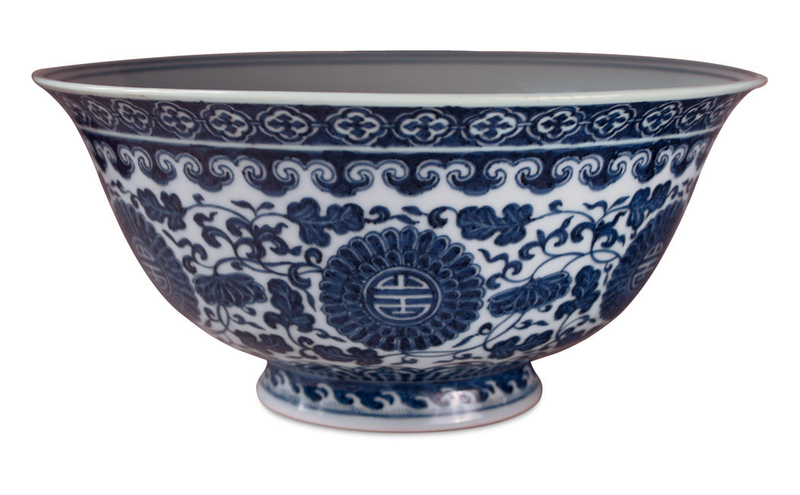 A fine large chrysanthemum bowl, with six-character Qianlong seal mark to the base and of the period, the rounded sides with gently outscrolled rim painted in Ming style in bright underglaze blue with simulated ‘heaping and piling’, with scrolling chrysanthemum tendrils interrupted by six flowerheads enclosing ‘ji’ good luck characters, a wave border to the short splayed foot, a further flowerhead to the interior, 9.65 ins (24.4 cms) diameter. 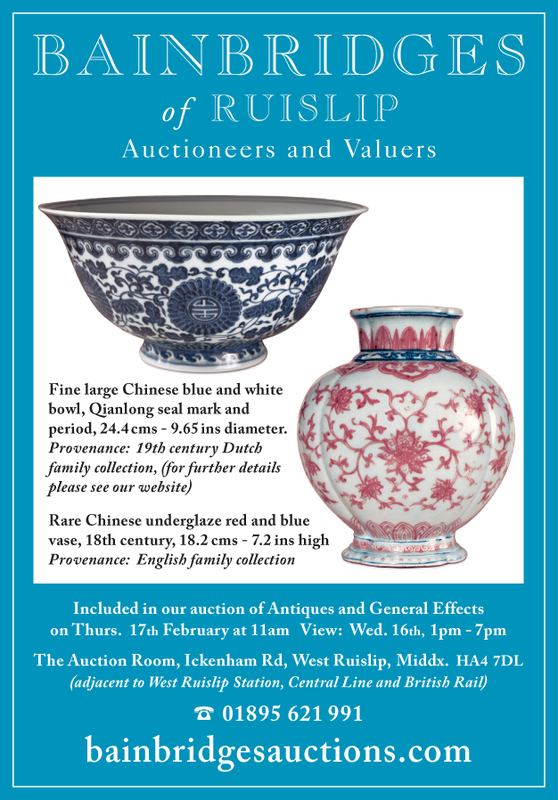 Provenance: A 19th century Dutch Family Collection. – Dirk de Graeff van Polsbroek, a DutchmanÂ with the nobleÂ title ‘Jonkheer’ (born Amsterdam 28 August 1833 – died The Hague 27 June 1916) had a highly influential Far Eastern diplomatic career. – De Graeff was a merchantÂ and a diplomatÂ in the service of theÂ Netherlands government, living in Japan fromÂ 1853 until 1870 and travelling extensively in the Far East. He became Netherlands consul in Kanagawa in 1861, was political agent and consul-general of the Netherlands to Japan 1863-1868, representative of Prussia and minister plenipotentiary of Denmark, Sweden and Norway to Japan, and minister-resident of the Netherlands to Japan 1868-1870. – He had a Japanese lady partner: Koyama Otjo, the daughter of a farmer and tea-merchant from Edo (Tokyo), with whom he hadÂ aÂ son, Jonkheer Pieter de Graeff (8 July 1861-7 August 1909) whom he legitimised in 1881. – He married in the Netherlands on 4 May 1870 Bonne Elisabeth Roijer (27 March 1847-19 May 1927),Â a distant relative of William of Orange, with whom he had 5 children. – As a diplomat he was highly respected by the Japanese government and by the emperor himself. Due to his extensive and highly succesful commercial activities he had close relations with Chinese merchants in Japan. It is likely that he alsoÂ travelled to China and had contacts with the tradingÂ house Jardine’s in Hong Kong. Because of his reputation and his excellent contacts, the Netherlands government offered him the post of ambassador to China which, for personal reasons,Â he refused and then resigned. 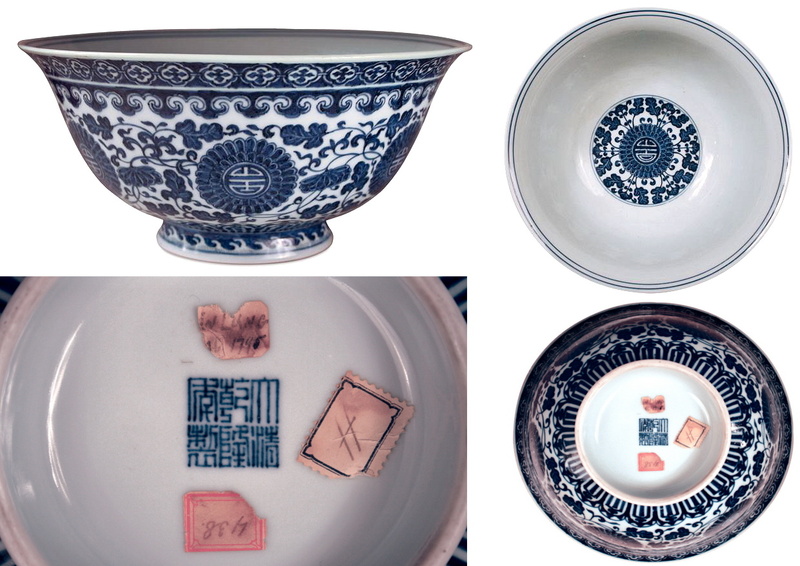 – It was during his time in the far East thatÂ Dirk de Graeff van Polsbroek acquired this Qianlong blue and white bowl, which is now being sold by a direct descendant. Note: further information, including several interesting photographs of De Graeff in Japan, is available on the internet. 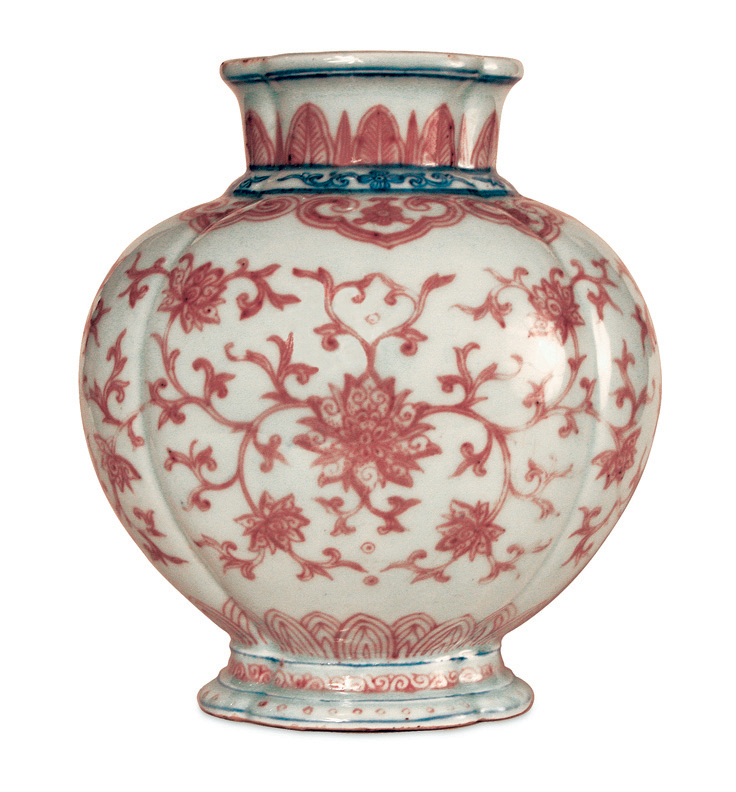 A rare 18th century Chinese underglaze blue and copper red vase, the rounded body of quatrelobed oval section painted in a soft pale red with a formal pattern of scrolling lotus, the short neck with a band of florets and scrolls in a bright blue below stiff leaves in a similar red, the foot with red borders divided by blue lines, 7.2 ins (18.2 cms) high. Provenance: An English Family Collection.